Love, Love, Love this stroller! 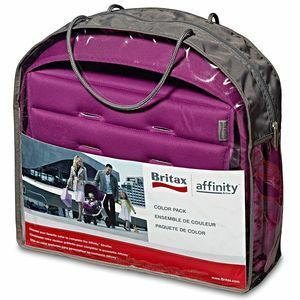 Cannot believe Britax discontinued selling this Affinity stroller, it is the best stroller ever! We have tried many strollers and this is the absolute best one and so we bought three of them; one for myself, one for my mother (children's Gammy), and one for my pregnant best friend. 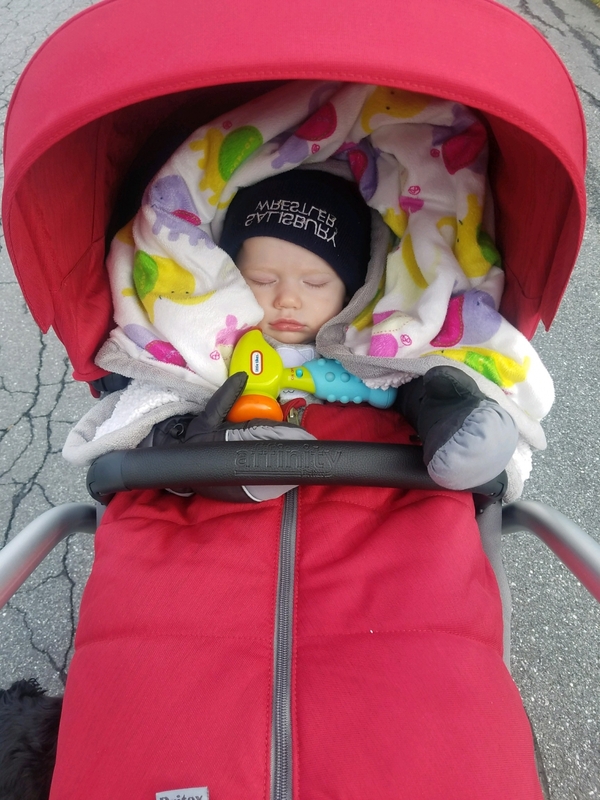 We take this stroller everywhere and we are stopped all the time by people asking us about this great one-of-a-kind stroller. A lot of thought went into the designing of this stroller! Pros*The baby can face you or face away from you (all other strollers face away). *Extremely smooth ride with adjustable shocks. *The various colors available are awesome. *The canopy unzips which reveals a screen to allow for a breeze on hot days. 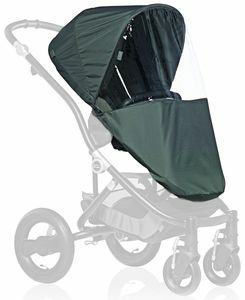 *It comes with a wind/rain guard and a sun guard to put over the entire cradle/seat to protect baby. *The entire cradle/seat is removable to take inside when baby falls asleep. *There are many positions for the baby, laying, halfway sitting, full sitting, etc. *The handle has various positions to accommodate the parent's height. *The handle has a middle one handed grip to use while walking a dog or holding the hand of another child while pushing the stroller. *Comfortable pho-leather handle cover. *Large basket at the bottom of the stroller. 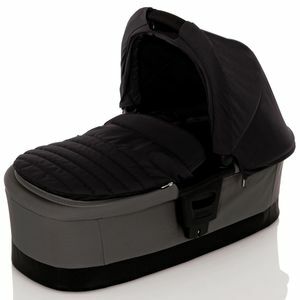 *A "Cozy Toes" can be purchased separately that fits on the cradle/seat for winter/windy cold days to keep baby warm. 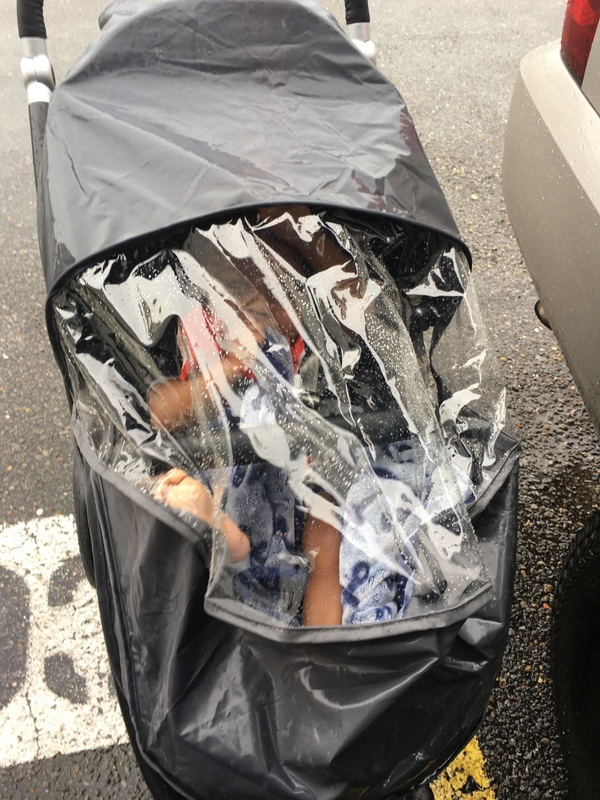 Cons*Weight of the stroller is a bit heavy, but it can be placed in two separate pieces inside vehicle to alleviate this issue. *Britax no longer makes this stroller. Best UsesUse the Britax Affinity stroller everyday for our daily walk and when going out shopping. We have a Britax B Safe Car seat and I love that this car seat clips in, but also comes with a clip on seat for when your child grows out of the infant seat. I tried the cheaper clip in strollers, but none actually clipped in - you had to use straps to hold the seat in place. I could not beat Albee Babyâ€™s price! It was the best price I found and fast free shipping! It was my first purchase through them and I have made several more since! Britax is my number 1 choice and I am happy with my order. thank you. Britax affinity is modern, full size but not bulky and sturdy.Sometimes I wish I did buy a lightweight compact stroller instead but there are some features that was must for my little son which a lightweight stroller doesnt have them:Forward facing seat for a baby is a mustMy son feels secure when hold the front barAdjustable footrestSeat recline fully flatMore features:Rain coverSun cover( which is useless)Removeable seat padAnd otherthan the heavy weight these are issues:Canopy does not fully cover sun ryes.Storage basket is not big like other full size strollers but still good size to put all grocery shoppings. Great stroller but a little heavy compare to other strollers. Pros:Luxury StrollerHigh enough to put the baby next to the table at the restaurant Back wheels made of rubber so it is good cushioning and also has spring in the front wheels.smooth ride and nice looking, nice handle.ConsHeavyDifficult to fold and get back in placeNot really for winter as it is a bit open if you have a car seat you need to take off the based and put the car sit instead. 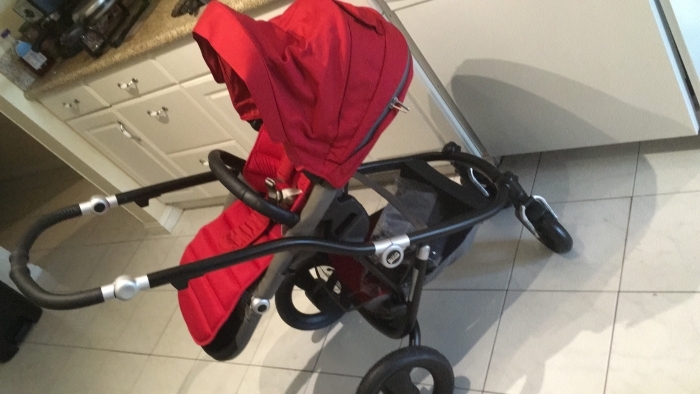 another difficulty.conclusion: good for the price but not a winter stroller and not recommend for travelling if you have to do a lot of folding or car sit swapping. I had a similar stroller for my kids by Peg Perego that lasted a really long time. The only reason I don't have it still is that a neighbor needed it for her larger child who could not walk. BUT This stroller is just as great. Love how smoothly it rides and it is very comfortable to push. The large hood also provides good shade. I also purchased the bassinet that goes with this stroller. While nice to have it isn't really necessary. The one GREAT thing about the bassinet is that it can be used as a portable bed for baby. 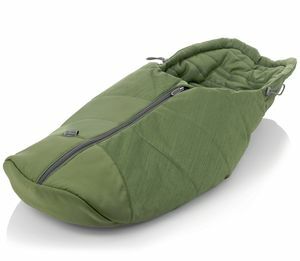 Good investment if you need a small portable bed for a newborn . ConsBasket under the seat is a bit small for this type of stroller/pram. Not a big issue for me. I love my stroller. It's not too heavy. I walk a lot and it rides smoothly even on the rockiest ground. We tried this out with our 1 year old and absolutely love the smooth ride and the ease of the recline! We have a b-agile that we love, but I think this may be my new go to stroller! The color pack is beautiful and feels much thicker and better quality than my b-agile. I would definitely recommend this stroller to all my friends and family! Just ordered this and received it last week. Loved the fast shipping! It was SO easy to put together. It took my husband about 10 minutes to put it all together. The color is beautiful (red pepper with white frame)We went to Disneyland and the stroller was great! I was able to put in 2 month old in so many positions and she loved it. The padding is so soft and comfy. My 4 year old got tired at one point and he was able to fit in it and he also loved the smooth ride. 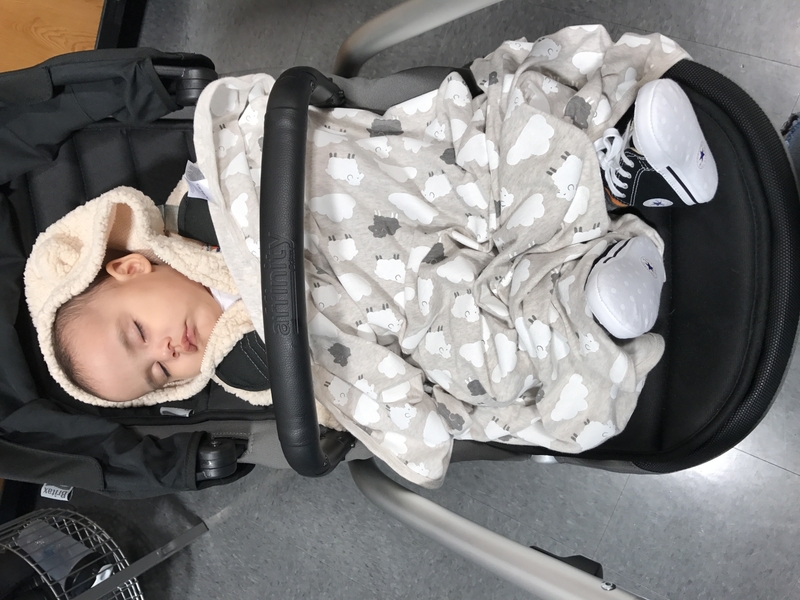 I love the fact that I can't just click in my britax infant car seat into it for quick runs to the store or if baby is sleeping. Overall a very fun and functional stroller. The fancy shmancy for a great price! 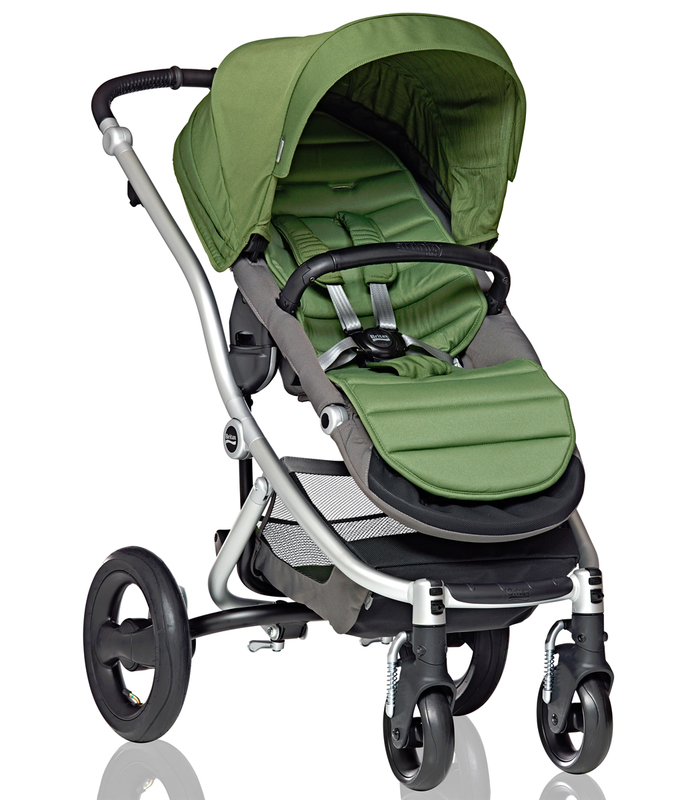 This stroller is just so beautiful and convenient to use. My son really enjoys the option of either seeing Mommy or the world. I get compliment after compliment! Really enjoy this stroller so far. Love th fact that the tires go over pretty much any terrain. We have a lo of uneven sidewalks in our neighborhood and it just glides over. I love this stroller but it's really heavy for a 3rd floor apartment step up. We are still awaiting our firstborn, but overall this product was easily assembled and breaks down/folds easily. The front wheel suspension is awesome and the wheels are set far enough apart to give parents peace of mind about any possible tipping. The storage underneath could be more spacious, but isn't all that bad. Would suggest black or silver frame due to scratching and scuffing, but like I said, we haven't put it under any practical tests yet. Switching the seat around is very easy. Fast shipping. Very good product at this price. Easy assembly, looks very comfortable. My son loves everything about the Affinity. As a dad, I must say I feel cool strolling around with the Affinity. Our first outing with it was on a rainy day and the included cover rocks!!!!! Awesome purchase!!!! ProsSmooth ride, sleek look, rain cover, great price, happy kido!! Stroller came fast and was very easy to assemble. Rides smoothly is cute and fashionable get complaints everywhere I go. 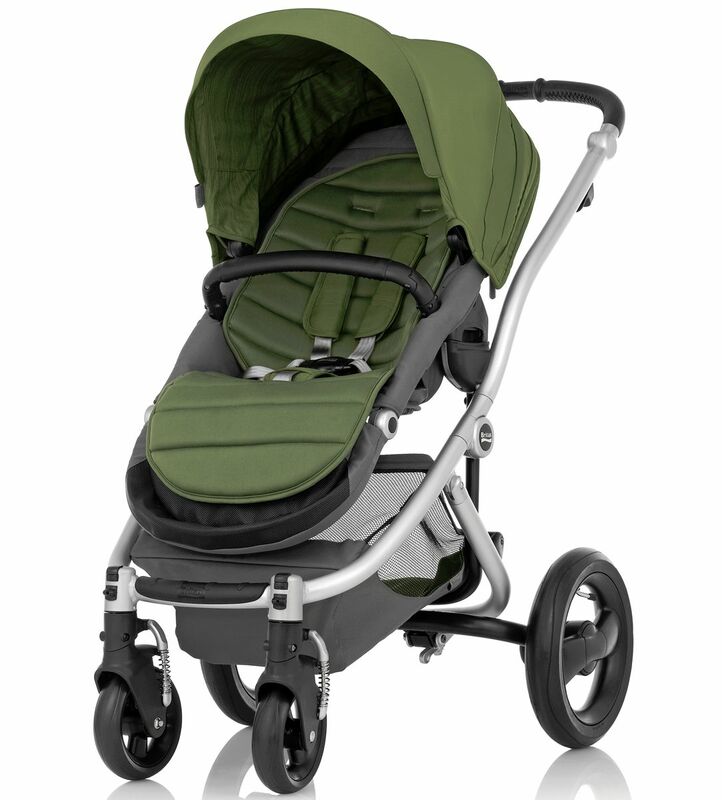 Love this stroller and every purchase off of Albee. I've been purchasing since 2006. So easy to order! And super fast shipping. Great price. I love Albee baby!! I was looking for a stroller with a smooth ride and a reversible seat feature without spending a fortune and this stroller definitely hits all aspects. The fact that the seat reclines all the way with baby facing me is amazing. Totally eliminates the need for a bassinet. It looks great and very easy no manuver. I also like the fact that the storage basket is easily accessible even when the seat is fully reclined. However....There are couple negatives. Biggest one is the depth of the seat. It seems very shallow. Although the stroller has the weight potential I'm not sure it will comfortably seat an older toddler. There are also no cup holders or snack trays. Need to buy separately. If the seat would be a little deeper I'd definitely give it 5 stars but for the price I paid I am super satisfied. ProsSmooth ride. Fully reclined reversible seat. Easily accessible storage basket. ConsShallow seat. No water bottle holder or snack tray. I love how simple this is to open and close. No, you can't close it with just one hand or adjust the seat positions with one hand, but it's easy and has so many positions that you can put it in. Yes, it's a bit on the heavy side, but that does help make for a smooth ride. Love how much storage space there is! This was an excellent buy. My daughter, who is extremely picky about things, is extremely happy with this item.Switching from front to rear view is supper easy. An excellent purchase. 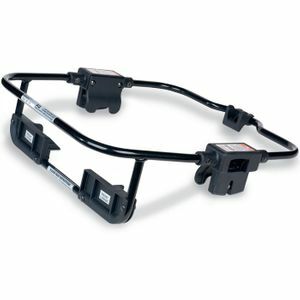 ProsThe ease of switching from front to rear view. the move ability is smooth. ConsMy daughter would liked the little window on the visor to be bigger, but was content with it. Best UsesAlso bought an infant seat and the adapter to put the car seat on the stroller frame. As stated earlier, my daughter is extremely picky about things and this was given a 5-star review from her. This stroller arrived super fast and it's everything I wanted. It came with a bug guard and rain guard. So far if only used it with my car seat clipped in and it rides super smooth. I love this stroller. So comfy for my 7.5 month old. When he falls asleep in it, I can just recline it so he can take a decent nap. It's a little on the heavy side but I love it! I rarely go out with just my little one so it's no biggie. Definitely recommend it to anyone and everyone. It looks so luxurious and so fancy honestly lol. I would buy this stroller over and over again with all the color packs because it's just great quality and the price was insanely good. L O V E IT ! I purchased this stroller first because I am a Britax fan, second because of the price for a full size/luxury stroller, third because of the vibrant blue color which I love, but what a disappointment:Pros:1-Beautiful colors, very cushioned seat liner2- It reclines very very close to flat position3-Rear-forward facing, adjustable foot restCons:1-You needs both hands to fold it and unfold it2-You need both hands to recline the seat (major issue)3-You need both hands to adjust the handle bar4-You need both hands to adjust the foot rest5-Heavy!!!! 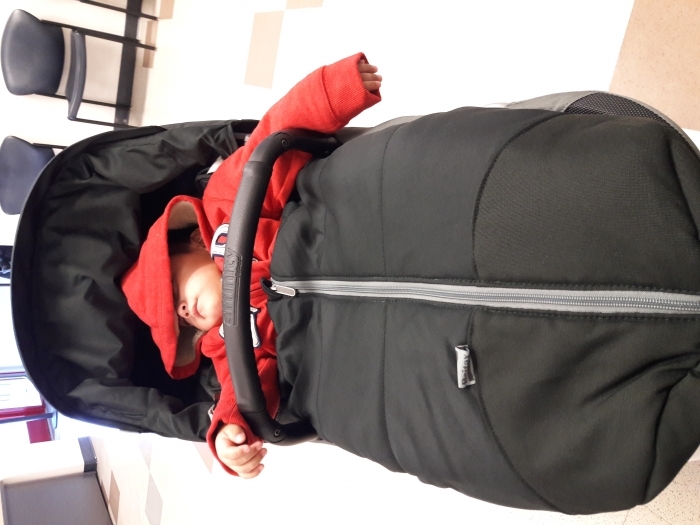 !Conclusion: I kept it because my LO is very comfortable in it, good price, it was a hassle to return it (no free returns), and the stroller is cute, but other than that its not practical at all, and reclining the seat with both hands its a PAIN. I love this stroller! After carrying my britax car seat back and forth to the doctors, my mom decided to buy me this stroller so it would be easier to take baby places. This is one of the best gifts we received for our baby. It's sturdy but not too bulky. I love that the britax car seat snaps right into place. It's easy to breakdown and load into the car and it's not too heavy. 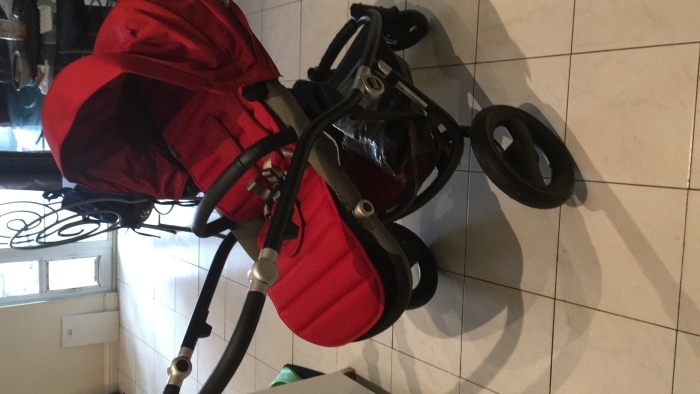 I have only used this stroller so far with the infant car seat attached but I'm sure it will work perfectly with the regular stroller seat attached as well. The price is fantastic as well. Don't hesitate to buy! I love the stroller how easy and light it feels. Very easy to assemble too. IGot the red peper color pack version. The recline position sold me but I thought that the seating part will be bigger and baby will sit deeper in the stroller.That's the only reason why I didn't give 5* I have not used the stroller yet but can't wait! We are loving this stroller and you can't beat the price. The details make this special. The ride is smooth and seems comfy. The only downside is the manufacturing date is 2014, but thankfully, strollers don't expire. we love this stroller because its seat can go rear and front very easily. also has a great storage space on the bottom without being too heavy and bulky. The price is unbeatable with all the option you get. I'm a big fan of britax brand, because it has good quality and reasonable prices for the quality. 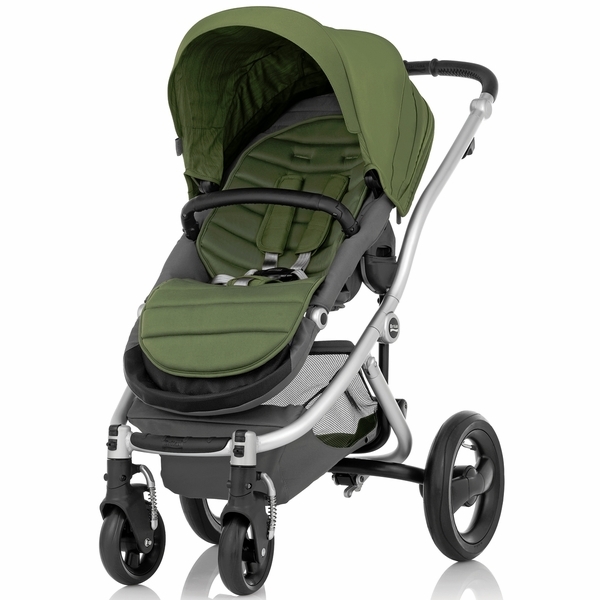 The design is very nice, looks similar to more expensive strollers. It is easy to assemble, and ride smoothly to take my daughter to places we need to go. It fits perfectly with britax b safe car seat. 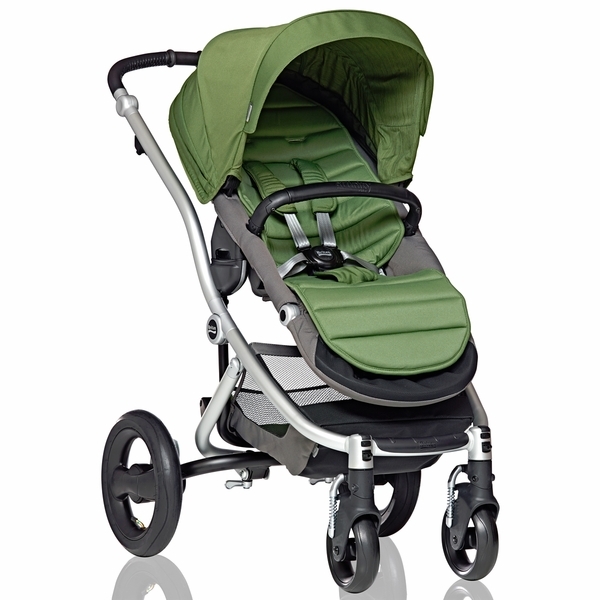 The price of this stroller is cheaper at albeebaby compare to other website, and also fast shipping. ConsNeed to watch for the tires for air leaking. 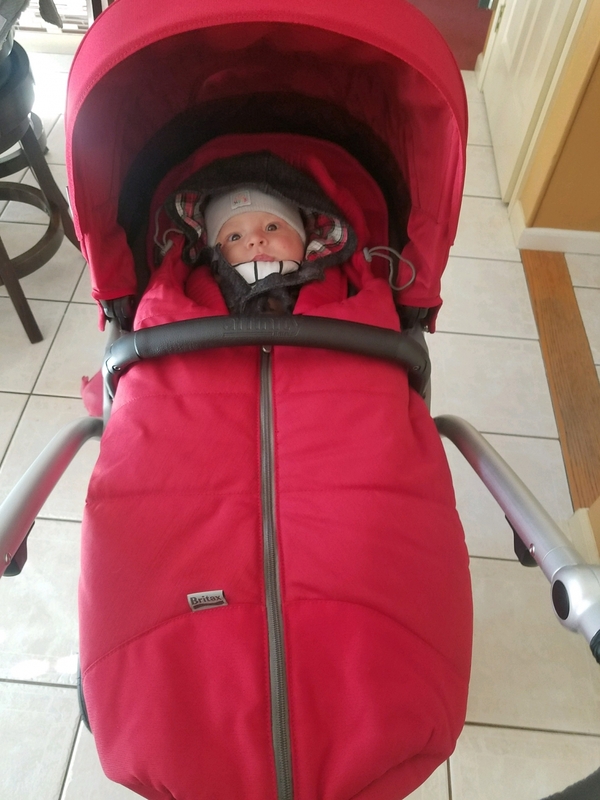 My sister recommended britax stroller to me many times! Since this unbelievable price I ordered it when I found it in the Albee website! I like it very much! Nice design, convenince for mother and comfortable for baby! ProsIt could be fold easily! It match with bob infant seat that I bought before! I like it very much! It just what I need! Very good quality! I really enjoy this stroller. Even though it a little bit heavy,it's safety. I love it. Easy to put together. Turns nicely and rides smoothly. Love everything about it so far. Out of all the strollers, this stroller been the most heavenly of all. 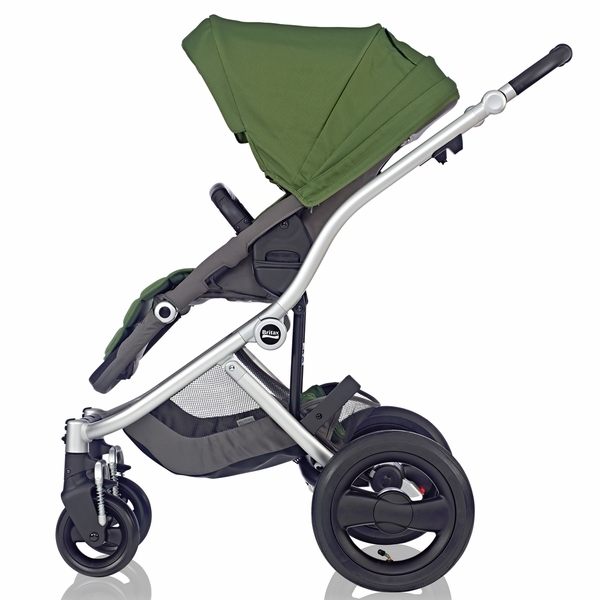 Despite it being a bit heavy which is expected from a full size stroller, it is definitely quality made. It has the smoothest ride for baby. The reversible seat makes it super easy to keep an eye on baby. The seating also keeps them super comfortable. My son falls asleep in it every time. He absolutely loves being in his stroller. It is great for any weather especially with the mesh and rain cover provided as well as the extended canopy. There is nothing to love about this stroller. I would definitely recommend to anyone tired of cheap made, overpriced strollers. 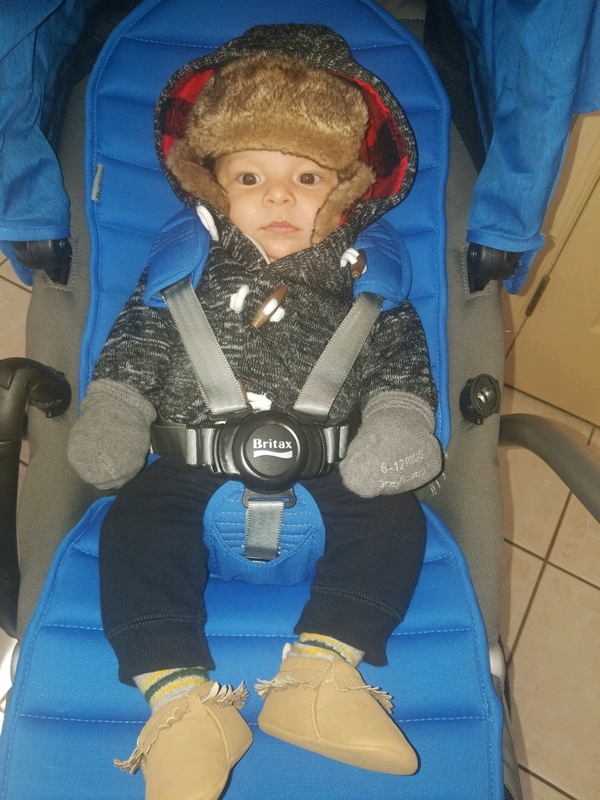 I also purchased a Cozy Toes footmuff for this stroller that works wonders in the winter time. What's the measurement of the back wheels? Folded Dimensions: 23.75" W x 17.5" H x 32.25"
High fashion meets high function with the Affinity Stroller. This refined, innovative design combines exceptional comfort and durability with sophisticated styling that can be customized to reflect your personal taste. 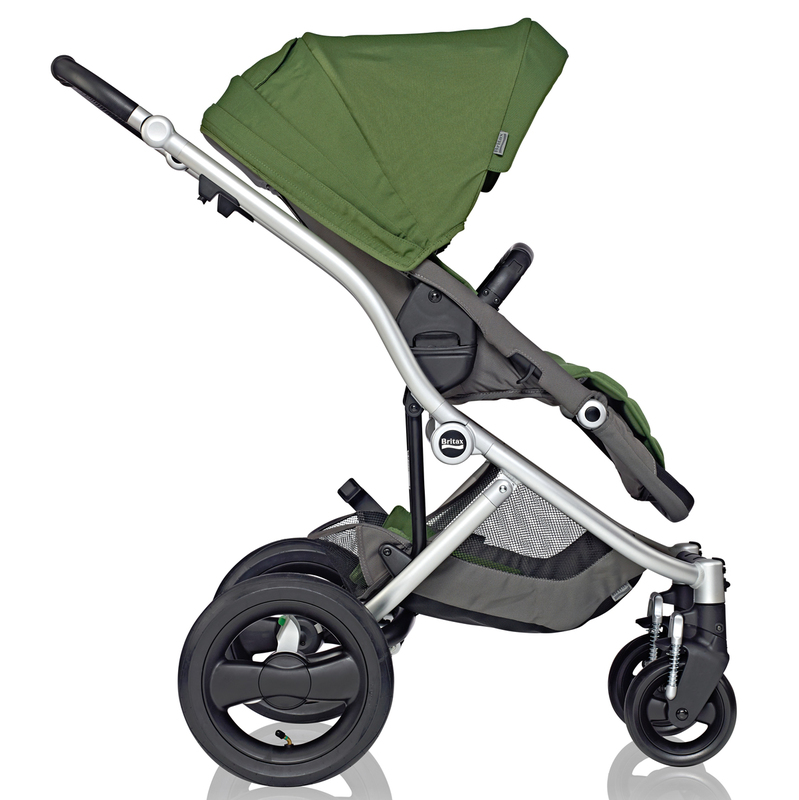 Premium convenience features and superior ergonomics create a stroller that is both easy on the eyes and easy to use. The Affinity is Click & Go ready and can be paired with Britax infant car seats or the Britax bassinet to create the ultimate travel system. Suitable from 6 months up to 55 lbs. Extra-Large Canopy with Ventilation Window keeps your child protected from the sun, wind and light rain. Air-Filled (Pneumatic) Tires with Adjustable Suspension System provides your baby with superior riding comfort. 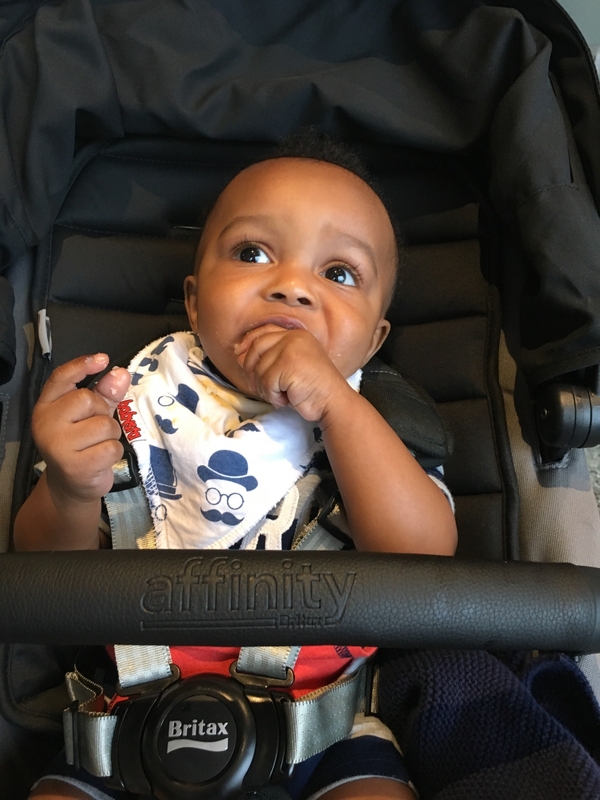 Reversible Top Seat lets you position the seat facing you to keep a watchful eye on your infant or facing outwards so your toddler can see the world. 4-Position Recline and Adjustable Leg Rest allows your baby to relax in adjustable comfort. Supple Leather-like Adjustable Handle raises and lowers to ensure comfort while strolling. 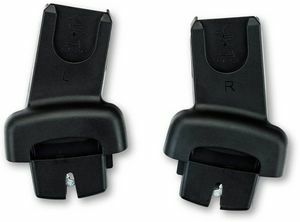 Integrated Click & Go Adapter allows for quick and secure connection to any Britax infant car seat or the Britax bassinet. Customizable Style choose from 3 frame colors and 6 color packs to match your personal taste. 3 Frame Colors available in white, black and silver to match your style preference. 6 Color Packs (only 1 included) complete your stroller with your own custom fabric look. Automatic Chassis Lock secures the closed stroller for safety. Large, Under-Seat Storage fits everything you need and is easy to access. Travel System Compatible with Other Major Infant Car Seat Brands* when used with Britax infant car seat adapter (sold separately).